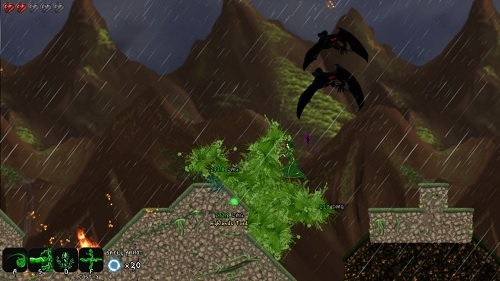 A Valley Without Wind 2 builds on the original game and offers plenty of new exploration and action orientated gameplay. In the second instalment of the series players take on the role of a mage who has been able to infiltrate the inner circle of the Demonaica. This position has unlocked the power of immortality for you and given you important knowledge and insight to use against him and save the world. You’ll tackle your goal in two parts and mastering both is important to your overall success. Players can set the difficult of these two game aspects separately which lets you focus more on one side of the gameplay if you want but its definitely worth keeping them at similar difficulty levels for the full game experience. 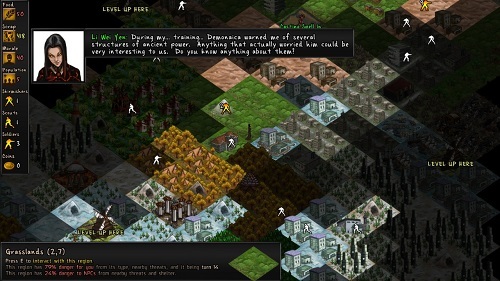 One side of gameplay is strategic and turn based while the other involves exploration and action based platforming. On the strategic side you’ll have to use your rebel army to scavenge for resources, rescue other survivors, build structures to help your cause and fight the army of Demonaica. To expand your reach and open up new opportunities you’ll have to jump into the platforming mode to destroy the wind turbines. While in this platforming mode players will get to customise and level up their character skills. A Valley Without Wind 2 has over 200 different spells to choose from, a huge number of equipment options and 12 different classes with their own stats for you to mix and match so the platform mode is definitely not short on options and is the best part of the entire experience, although it is slightly let down by some control decisions. A Valley Without Wind 2 is a very unique experience that has so much to do and explore its easy to get lost in the game world. Mix of strategy and platforming. Large number of spells (over 200). Choose from 12 characters from different time periods. Impressive soundtrack keeps you battling forward. Plenty of improvements over the original.